Are you ready for all things Halloween? It’s time start making some creative, creepy, spooky treats for get togethers and such! This Puking Pumpkin featuring Guacamole dip is a sure fire hit! Cut into the top to remove the stem like you would when you carve pumpkins and then completely clean out the pumpkin. Then use a marker to draw the eyes and mouth. Make sure the mouth is low and has a wide enough opening to allow the "vomit" to come out. Place your pumpkin on a large plate or serving platter. Place the backside of the pumpkin close to the end or edge of the plate. 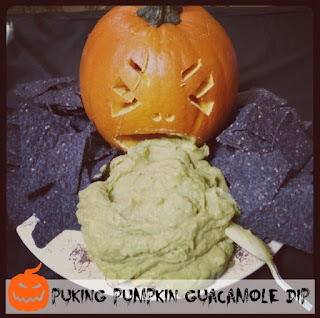 Add a spoonful of guacamole (homemade or store bought) through the top of the pumpkin and put it on the bottom of the pumpkin by his mouth. This is fun for the kids and super tasty!